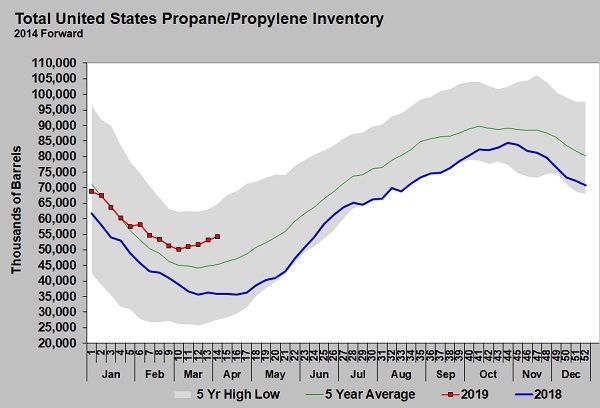 U.S. propane inventory has been declining at an above-average pace over the last few weeks. 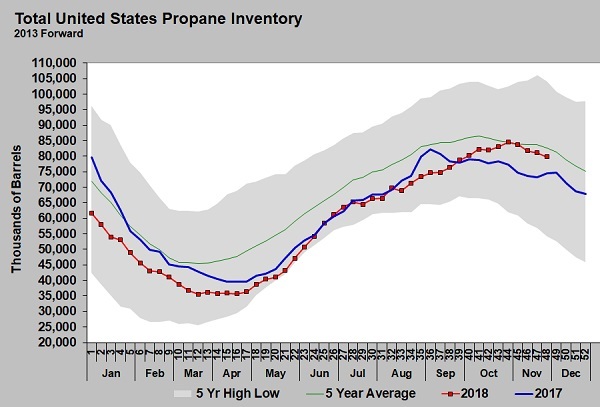 The inventory-build period lasted longer than normal, as U.S. propane exports and domestic demand did not keep up with the rapid growth in propane production. After peaking five weeks ago at 84.528 million barrels, propane inventory declined 4.722 million barrels per day (bpd). The five-year average decline for that period is 1.931 million barrels. The primary reason for the decline, aside from ample domestic demand, is exports averaged over 1 million bpd for three weeks, according to U.S. Energy Information Administration estimates. As the chart above shows, the export rate is not as high as last year. Exports have stayed above 1 million bpd for a significant amount of time. The chart also shows how volatile exports can be. The last three-week stretch where inventory exceeded 1 million bpd was February 2017. Prior to this jump in exports, this year’s export rate was just 7.2 million bpd higher than last year’s. After the three-week period, exports averaged 11.45 million bpd higher than last year. 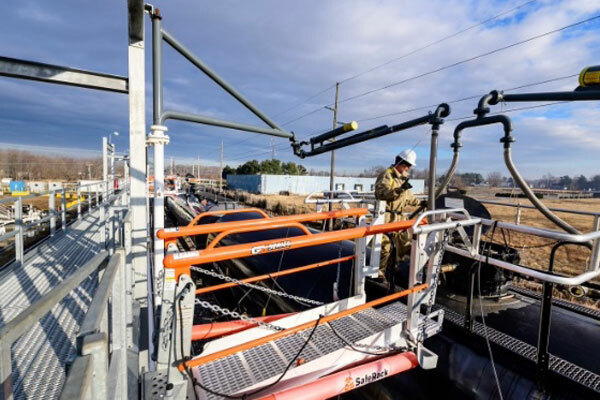 That number still is considerably less than the growth in U.S. propane production, which is averaging 138,000 bpd more this year than last year. Despite the draw on inventory over the last three weeks, it still is 5.336 million barrels above last year. Weather outlooks are supportive of solid domestic demand. Should exports continue to run in the million-bpd range, that surplus is likely to disappear rather quickly. Keep in mind, Mont Belvieu propane traded at 72 percent of West Texas Intermediate (WTI) crude at this time last year. 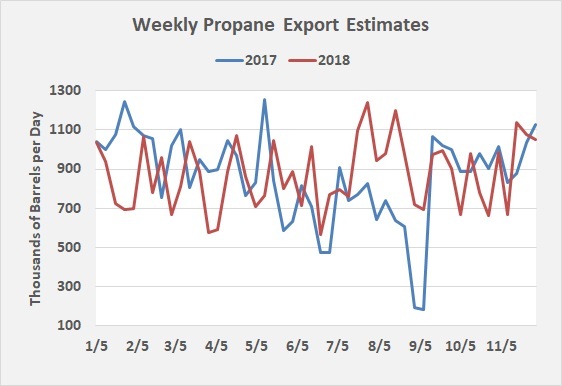 It is currently at 59 percent, and rose from 55 percent over the three weeks that propane exports have been running more than 1 million bpd – and inventory has been declining at an above-average pace. It is not unrealistic to imagine propane’s value relative to crude continuing to improve if the inventory surplus to last year falls more. If crude prices don’t increase at all and propane moved to 72 percent of crude, propane would be at 92.25 cents. Unofficially, the Organization of the Petroleum Exporting Countries and other producers agreed to a 1.2-million-bpd cut from their October production rates for 2019, which could push crude higher for a while. WTI crude is currently $22.75 below its $76.41 high, which was set Oct. 3. If the production cut causes prices to recover just $10 of that decline, WTI would be at $63.66. 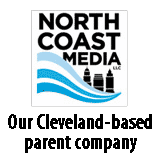 If propane stays at 59 percent of crude, it would be valued at 91.31 cents per gallon at $63.66 crude. If crude gains the $10 per barrel and propane fundamentals push it to 72 percent of crude, its price would be 111.43 cents. If propane’s relative value moves just halfway to where it was at this time last year, its price would be 99 cents, at around $64 crude. We are not predicting any of these prices, but the upside risk is present. 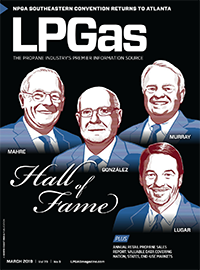 Propane fundamentals could continue to tighten. The crude production cut could cause a $10 rise in WTI crude. 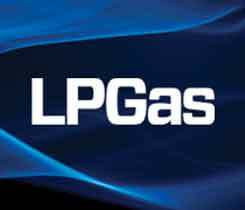 At this point, it is easy to see several paths that lead to propane prices in the 90-cent range again. 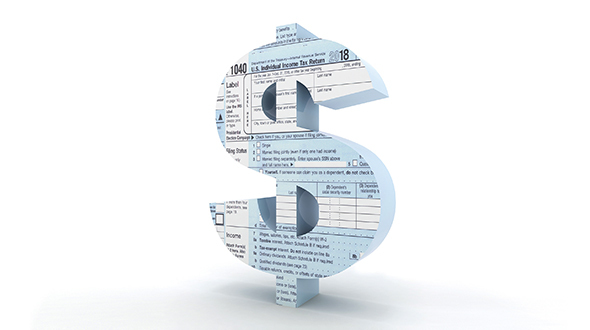 Short-term price protection seems warranted, given recent developments.